Insomniacs suffer from a sleep disorder that makes it difficult to fall asleep, or stay asleep, throughout the night. There are many pharmaceutical medications prescribed to treat insomnia, and a lot of them work. However, like other synthetic drugs, they carry with them the threat of dangerous side effects which in this case include dizziness, headache, uncontrollable shaking and, of course, addiction. 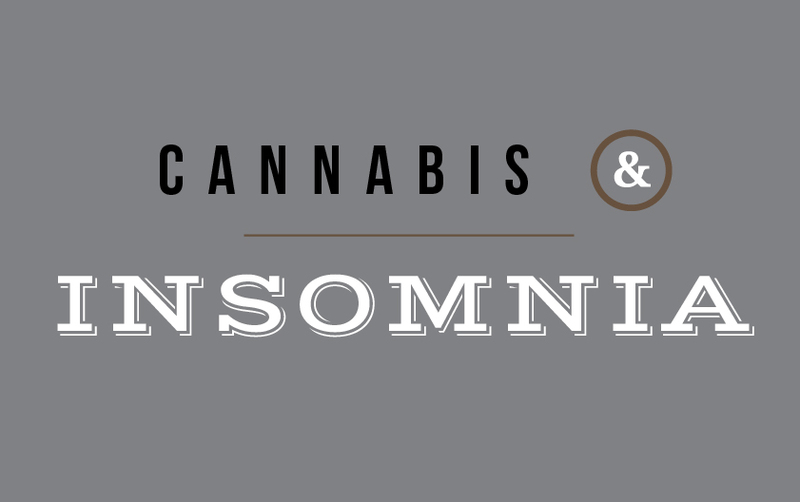 This has many wondering if cannabis can help with insomnia. Cannabis could be a safe and effective alternative for managing insomnia and other sleep-related problems. When our bodies feel tired, how deeply they sleep, and when they wake up all have to do with our circadian rhythms. The body’s endocannabinoid system – that series of neural pathway activators nearly identical to the compounds in cannabis – appears to be intertwined with this essential rhythm, and a balanced endocannabinoid system can contribute to a regular sleep cycle. This means, then, an out-of-sync endocannabinoid system could be partly to blame for poor sleep or even diagnosed insomnia. Luckily, there is a low-risk way to re-balance your body’s endocannabinoids: introduce new ones by using cannabis. Only one small scientific study has explored the link between cannabis and diagnosed insomnia, and it took place more than forty years ago. After administering a dose of THC (the most prevalent cannabinoid in cannabis) to insomniacs, researchers found their subjects fell asleep much more quickly than when they were denied the treatment. Though the THC had little effect on overall awakenings during the night, it did seem to minimize the number of interruptions in the first hours after the patients’ fell asleep. Lasting effects from the THC – a sort of “hangover” effect – were noted the next day, and were seen to increase with higher dosages. This side effect of the THC is not unexpected, given the compound’s known psychoactive properties. For people who do not need to be strictly focused the following morning, therefore, a small dose of a THC-dominant strain or product could provide a better, deeper sleep free of detrimental drawbacks. Individuals who have used products with high CBD (the second-most prevalent cannabinoid) for its excellent relaxation effects might be surprised to learn that most research shows CBD is not the right choice if you’re aiming for better sleep. Animal studies using rats have shown that this non-psychoactive compound causes the opposite effect, encouraging wakefulness. Only one study, published in 1981, mentions CBD as a sleep-inducer, and this effect was experienced by only two of the eight participants. Sleep apnea, which is caused in part by difficulty breathing, is another condition that may benefit from cannabis. While this disorder can cause serious problems, at minimum it acts as a hindrance to proper sleep, causing sufferers to awaken suddenly and repeatedly during the night. Recent, preliminary studies have shown THC could help improve muscle tone in the upper airways, preventing temporary collapses and breathing interruptions, and in turn improving sleep quality. An eight-year-old study that examined how various “illicit” drugs effect sleep, found cannabis (specifically THC) seemed to increase the third stage of non-REM sleep. (At that time, it was known as the fourth stage, but the third and fourth stages have since been combined.) This stage is known as deep or slow wave sleep, and kicks in about 45 minutes after we fall asleep. During this stage, the body works to replenish energy, and it is quite difficult for the sleeper to be awakened. Cannabis also appears to decrease the length of the REM sleep stage, the stage in which we dream. Science is still working to learn the purpose REM sleep plays in our health and day-to-day functioning, but since it is likely an important stage, if you are using cannabis to help you sleep, stay alert to what your body is telling you. If, after a few weeks of treatment you feel regularly unrested or unfocussed, you may need to decrease your dose, try a different strain, or seek an alternate therapy. Whether or not cannabis works as a sleep aid for each individual, it is important to note that if the treatment is stopped, they will probably notice disruptions in their sleep for the next few days, while the body re-adapts; some people may even be bombarded by REM dreams that were previously suppressed. The scientific evidence on cannabis’s sleep-inducing properties is a bit convoluted, but there is enough anecdotal evidence supporting its benefits that people suffering from insomnia or difficulty sleeping may well want to give it a try. Any one of FARM’s knowledgeable staff members can fill you in on the best strains and cannabis-based products for battling sleep problems, and put you on the road to sweet dreams.